The Gopher Protocol is a simple client-server network system built around a system of menus and files. Launched in 1991, it was proposed as an alternative to the HTTP(S) system that underpins the current World Wide Web. Although Gopher's simplicity ultimately caused it to lose out to the Web, it was fairly well supported in the early 1990s with thousands of Gopher servers across the world providing access to documents, images and audio files to anyone with a Gopher client on their machines. Many of these servers were hosted by Universities and other academic institutions. By the end of the 1990s interest in Gopher declined rapidly, and it almost died out as a service, with only a few servers remaining. However, "what is old, is new again", and over the past few years many hobbyists have started up their own personal Gopher Servers with small cheap machines such as the Raspberry Pi making it cost effective for anyone to self-host an internet facing server. If you want to learn more about Gopher, then Cameron Kaiser's Floodgap.com is the place to start, as it's generally considered to be the home of Gopher in the 21st Century. I have also written a Gopher Browser for Windows, which works on all current versions of Windows from 7 through to 10. Why not download it, and try it out? This Map shows all the nodes found in a scatter formation, with lines depicting their links to other servers. Larger nodes have significantly more Menu pages than the smaller nodes. Due to the way the nodes are distributed randomly, this map is unique and cannot be reproduced. You can also download/view a larger version of this map, or purchase a printed copy. This Map uses the Geo-Location of each Gopher Server's IP address in Latitude and Longitude values and converts them into X:Y co-ordinates to show approximately where in the world each one is. Only live servers are shown on this map. A high resolution printed copy of this map is available to buy here. I wanted to create a visual representation of the current state of Gopher Servers in 2018. I wanted to do this to prove to the nay-sayers that there are Gopher servers out there with content on, and because I enjoy visually mapping any connected data I come across. I'm also a fan of Gopher (along with other retro/obsolete computer-based services and equipment) so this was a fun project for me to attempt. Crawl all known Gopher Servers for Selectors (aka Links) to other Gopher Servers. Add any newly found Gopher Servers to the known list. Log the IP, the number of type '1' pages (Menus) on each server, and the number of external links to other Gopher Servers. 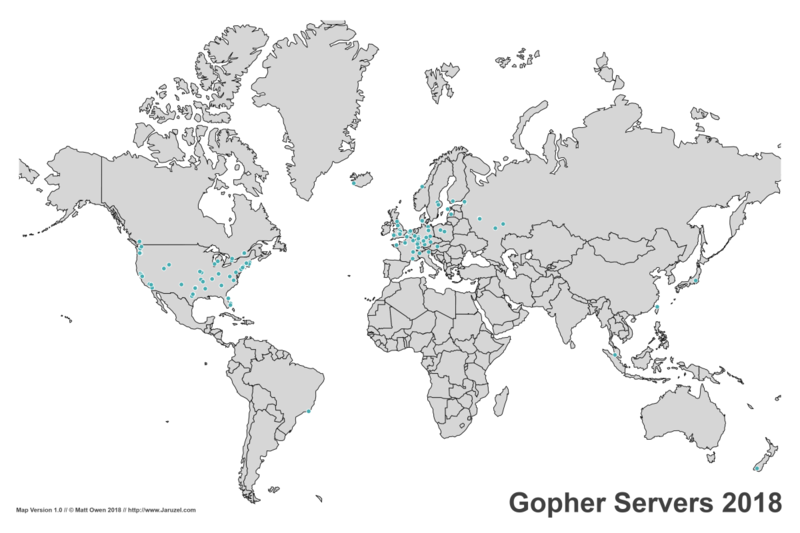 Use the IP to Geo-Locate where in the world (approximately) the Gopher Server is hosted. Identify any Servers that are online but where the Gopher Service is offline. Identify any Servers that are linked to, but no longer exist at all and should be considered 'dead'. Using the data collected, programmatically build a scatter map of the network. Using the Geo-Location data, programmatically build a World Map of the live servers. The crawler was quickly thrown together and contains quite a few crash-worthy bugs. As such it needed to be restarted from the crash point a few times. Some content was lost during these crashes, so I know the crawl data is not 100% perfect. Also, there are a few servers out there with circular selectors that look unique but aren't. These servers ended up having almost no data collected as crawling them became difficult. Addtionally, I'm not happy with the Mesh Map, it needs some more work on how the nodes are distributed. When I do the maps again (in 2019) I'll work some more on the layout and crawl efficacy. Regarding the sale of the posters; I'm not selling them to cash in and make tons of money. Using an online service seemed to be the easiest way to provide high quality versions. From the two maps above, I only get 53p and 70p respectively in royalties per sale. If you have any suggestions or comments, please feel free to contact me.